Even in fairy tales, not all endings are happy. This week, we were witnesses to a tragic story with a silver lining. Along the northern shore of Lake Apoyo, howler monkeys have proliferated, so much so, that Laguna de Apoyo Nature Reserve is now among the best locations in Nicaragua for monkey watching. Golden-mantled howler monkeys regularly enter the areas where housing was constructed in the 1960's and 1970's, between the access road and the lake. (White-faced capuchin monkeys also inhabit our area, but are fewer and occupy very limited ranges.) This means they are entering yards of homes and coming into contact with electric transmission wires. As a group of monkeys moved through the forest and into a neighboring yard, one female monkey managed to cross wires and was electrocuted. When we learned of the event, we were mobilized to do what we could. 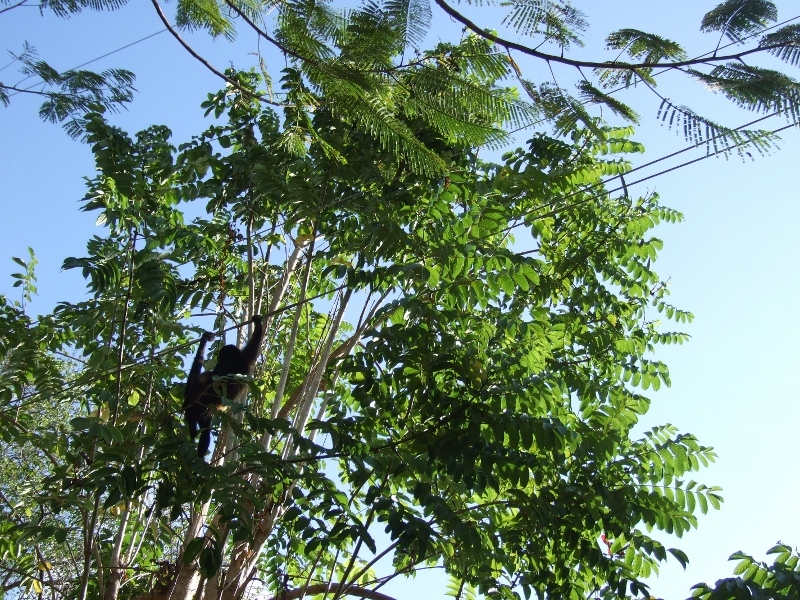 When we arrived on the scene, the lifeless body of the monkey was still attached to the electric wires, which had shorted out and no longer carrying current. Clinging to her waist was a terrified baby, still very alive. This baby golden-mantled howler monkey clings to her lifeless mother. Photo by Susana de Winne. We asked ourselves whether the infant monkey had survived. Mother and baby were about five meters above the ground, the mothers tail and paw locked around the wire and the baby clinging to her mother's lifeless body. After several minutes, the baby monkey raised her head and blinked. We didn't know what to do next, but we were happy to know that one life may not be lost. Tense moments when a baby monkey's life was at risk. Photo by Susana de Winne. We were concerned the baby would fall with or without her mother, and suffer a bad injury or death. Additionally, the monkeys had now attracted the attention of several neighbors, and we were also concerned that the wrong neighbors would capture and keep the monkey as a pet. The baby howler monkey was disoriented and anything was possible. We quickly installed a sheet beneath the wires to catch the animals in case the grip of the dead mother would release. And we watched and waited. The baby monkey continues to cling to her mother. Photo by Susana de Winne. After another half-hour, the infant monkey climbed off her mother and into the nearby trees. We contemplated whether we should capture the baby, while the baby continued to move. Soon, she was in a tall tree, and we sighed from relief. There are folks who would not hesitate to capture her if they could, to enslave her to the pet trade, a fate nearly as bad as death. We only hoped the infant would quickly reintegrate with her troop, which had departed after the horrible death of the poor mother monkey. Electrocution by electric utility wires is perhaps the greatest factor in mortality of howler monkeys and other animals in Laguna de Apoyo Nature Reserve. Photo by Susana de Winne. While we watched the infant monkey, the unscrupulous people who had gathered knocked down the dead mother monkey from the electric cable. We returned to recover her body and prevent others from selling her or using her body for any other purpose. We lingered while watching her body lying on the sheet where she had fallen. 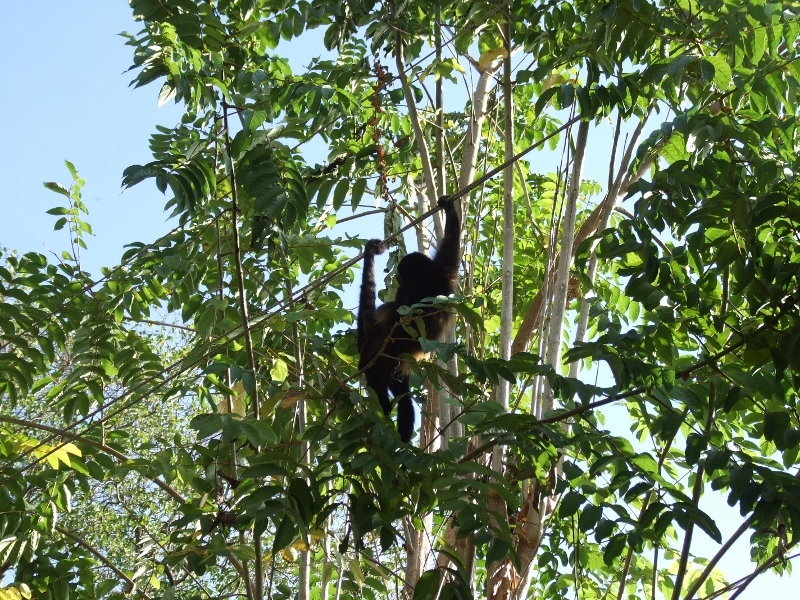 Her tail and two limbs were locked in their contracted positions, an adaptation among these animals to allow them to sleep in trees without falling. There were small burns on her hands and tail, otherwise, she looked a perfect specimen in the prime of her life. No fleas or mites were jumping from her body, no injuries or scars were evident. Her half-opened eyes betrayed her final moments when death stole her away. Her breast was full, vainly awaiting her offspring. We recovered her body, from which we will conserve her skin and skull for scientific and educational purposes. 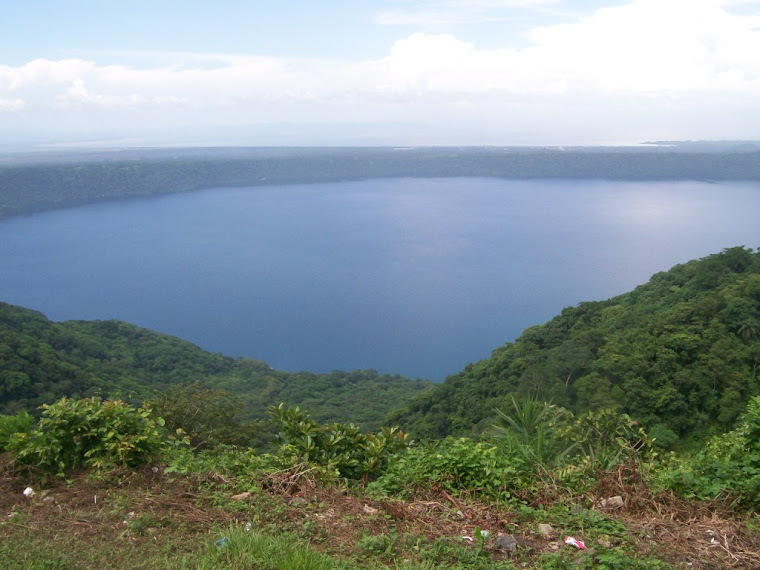 It is our hope to make Laguna de Apoyo Nature Reserve safe and prosperous for the wild animals which need its forests and water. Part of what we do, at times, is no more than give witness to what we see. Life is hard for humans, and even harder for wildlife. 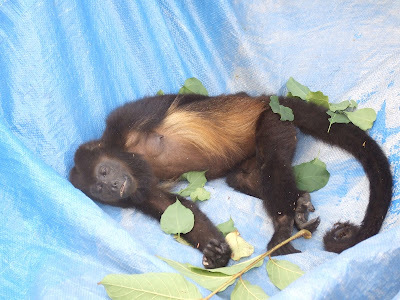 Mortality among monkeys is very high, from our casual observations, sometimes from falling from trees, other times from the cruelty of people, and sometimes, electric wires. 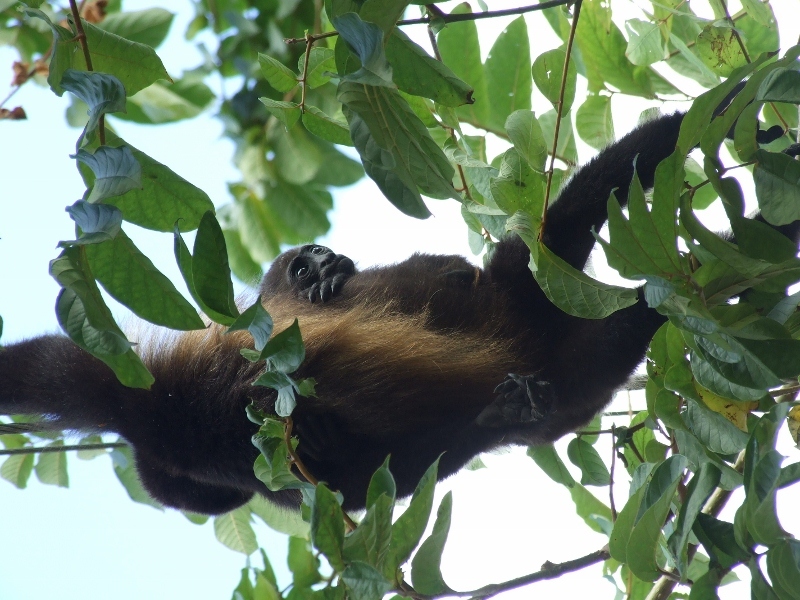 Our electrical connections in Laguna de Apoyo Nature Reserve need protectors to save wildlife from the risks of electrocution. Too often, arboreal animals are killed by the wires. FUNDECI/GAIA has discussed the issue of electric transmission wires with MARENA and will be seeking solutions to the risks to wildlife by this modern convenience of man. It is the least we owe our wild neighbors. After all, we live in their yard, not vice versa!